BMA has been a prime offeror on the Army Evaluation Center’s Test and Evaluation Support Services (AEC-TESS) IDIQ since 2015. BMA has provided support to the test and evaluation of Mounted vehicular systems; Aviation fixed and rotary winged aircraft and their associated ground support systems; Electronic Warfare systems; and Cybersecurity assessments of Combatant Command networks. Primary duty locations are Aberdeen Proving Ground, Maryland; Stuttgart, Germany, ATEC Test Centers located at Fort Huachuca, Arizona, Yuma, Arizona, White Sands Missile Range, New Mexico; Redstone Test Center, Alabama; the following Combatant Commands: US European Command, US Africa Command, US Central Command, and US Southern Command; and in Theatres of Operations. Test and Evaluation support for the Bradley and Joint Light Tactical Vehicle programs. Test and Evaluation support of the Grey Eagle unmanned aerial vehicle; Fixed -wing Utility Aircraft, and associated ground support equipment. Test and Evaluation of opto-electrical sensors, Intelligence Fusion systems, and Airborne Intelligence Surveillance and Reconnaissance platforms such as Enhanced medium Altitude Reconnaissance and Surveillance System (EMARSS), Persistent Surveillance System-Tethered (PSS-T), Assured Position, Navigation and Timing (A-PNT); and Tactical Sigint Payload (TSP). 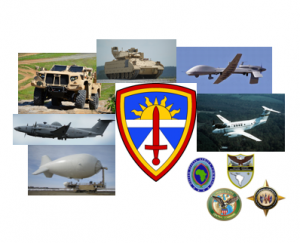 We provide support in the Cybersecurity assessment of Combatant Command operational networks.